Tom Hatten, a fixture on L.A. TV for decades renowned for his encyclopedic knowledge of entertainment, died Saturday, March 16, at 92, KTLA producer Joe Quasarano reported. Hatten was born November 14, 1926, in Jamestown, North Dakota, growing up in Caldwell, Idaho. He was in the U.S. Navy and attended the Pasadena Playhouse on the G.I. Bill, becoming a KTLA on-air personality in 1952. 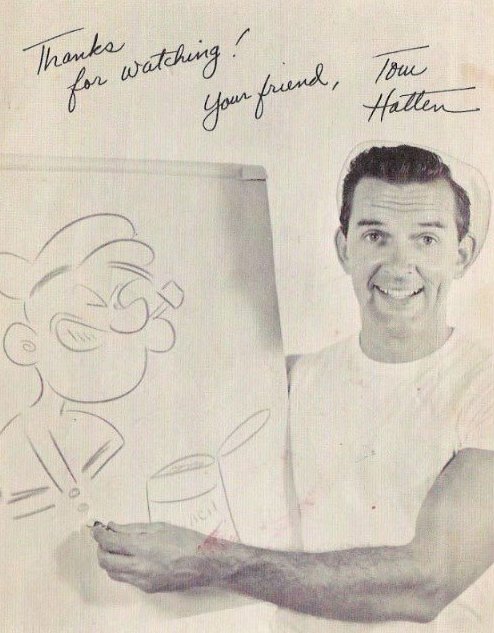 Hatten was best-remembered for hosting KTLA's kids' shows The Adventures of Popeye (1956-1964) and Popeye and His Friends (1976-1988), and also hosted the network's The Family Film Festival (1978-1992). At the same time, he worked as KNX 1070 News Radio's entertainment editor from 1978-2007. As an actor, Hatten had a couple dozen credits to his name including a TV debut in 1963 on The Eleventh Hour, and appearances on episodes of TV series including The Farmer's Daughter (1964), Mr. Novak (1965), Gomer Pyle: USMC (1964-1965), The Man from U.N.C.L.E. (1965), The Beverly Hillbillies (1965), Get Smart (1969), Julia (1970), Wings (1995) and The Nick Cannon Show (2002), the latter of which was his final TV appearance, and one on which he played himself. He also popped up, albeit sparingly, on the big screen, in the camp classic I Saw What You Did (1965); A Very Special Favor (1965); Easy Come, Easy Go (1967); Sweet Charity (1967); Spies Like Us (1985); and provided a voice for The Secret of NIMH (1982). His last on-screen appearance was in the short Bravura (2004). Hatten is survived by his partner of 50 years, Pete Menifee, and numerous nieces and nephews.